The Premier League matches return with match week 4 resuming following the international break. I, for one, am glad to have the Premier League starting up again. International matches just don’t have the same intensity for me as the Premier League. 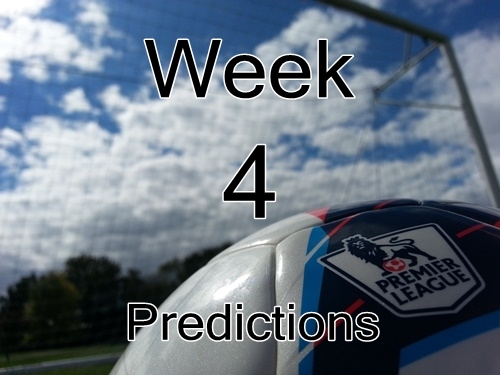 With match-day four returning, so are my predictions for the weekend. This will certainly be an interesting weekend since it will be the first set of matches following the end of the transfer window. There are certainly going to be questions about which teams will start their new signings and how they will do. Manchester United will certainly be at the top of this list considering their most recent three signings and whether Falcao will start. Add to that the fact that there are debates about which player will be dropped and it makes their match against Queens Park Rangers quite interesting. Elsewhere, Manchester City faces off against Arsenal in what will certainly be a good match. Chelsea and Swansea City will face off as the only two teams who have yet to lose while Aston Villa travel to Liverpool in hopes of staying above them in the table. As always I will try to get out a post later in the week with my quick picks and brief match previews for all of the weekend’s action. You can also check out the Premier League table which I update following match results. Please feel free to leave your own predictions in the comments below. Are there any predictions that you disagree with? ← Who’s To Blame for Manchester United’s Squad Problems?